We hauled out almost yearly between 2009 and 2014 at Ventura Boatyard for repairs (we kept hitting things! Had to learn somehow!) for 2-4 weeks at a time. Then in March 2015, we splashed Aldebaran into the water after four exhausting months in Ventura Boatyard, prepping the boat for the voyage south. Since then, we’ve been trying to make do with some limited options! Two years into the voyage, in January 2017, I careened Aldebaran at a beach in Bahia Caraquez, Ecuador, for just one day, to repair the rudder mount and install a new depth sounder. Read about how we kept from breaking the boat’s keel in our Ecuador section. Then in July 2017, we hauled out in the Marquesas for emergency repairs – we suspect colliding with something that cracked the fiberglass under the wing, during the seven day passage from Gambier. Water pressure forced into the crack and delaminated a 5ft wide section of fiberglass. For two weeks we scrambled to repair that damage and other impacts to the hulls from during our journeys in Central America. 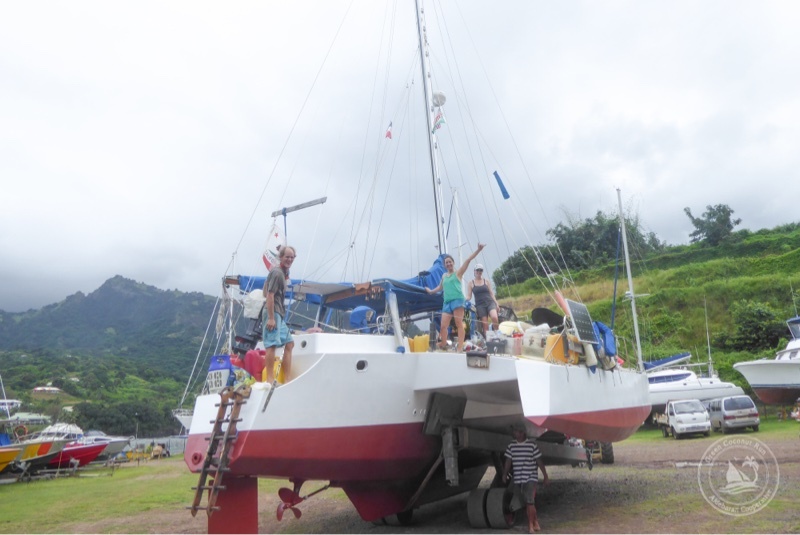 Read about our fiberglass battle at the Hiva Oa boatyard here and about our jaw-dropping visit to Marquesas here. So, why are we hauling out in 2019? Our 1968 trimaran has been a stout ship and endured a lot of beating in the last 10,000 miles since we left home. The main area of structural wear is in the underside of the wings, where the plywood joins the beam — it has slowly worked itself loose and vibrates badly as we go upwind bashing into waves. Many crew have come up with funny descriptors for this, since the crew bunks are directly above the wings. If we’re going upwind, waves pound dramatically against the bottom of their bunks — sometimes it looks like the sleeping crew mate is getting defibrillated ! Dave Clark said it felt like a crazy kid hitting the bottom of his bunk bed with a 2×4 piece of work. 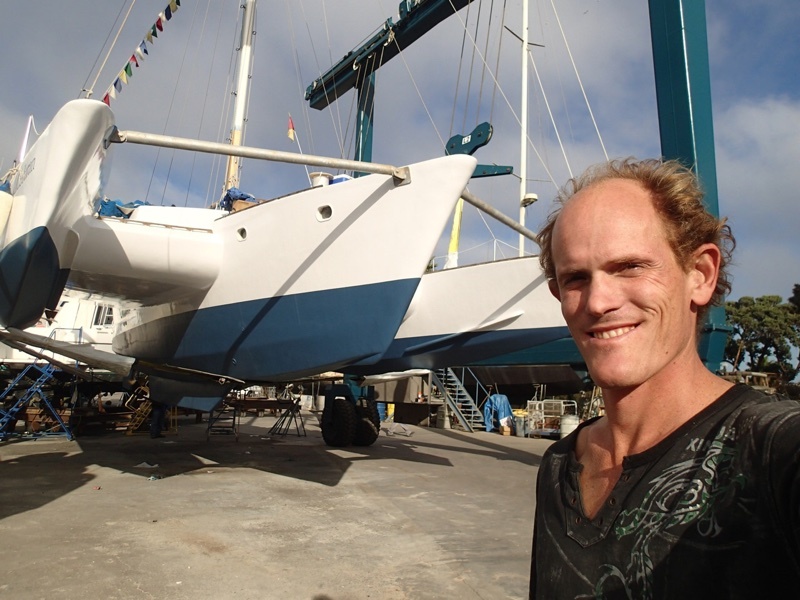 Michael Payne had his own concerns as we began our 21 day passage across the Pacific. The reality is that Aldebaran is a little too low on the water (over-loaded with weight) which exacerbates the problem, and something we want to remedy by off-loading the boat of spare parts. The thousands of waves hitting the bottom of the wings have worked the joint between the plywood and beams loose. I managed to install a few screws and bolts to tighten things up while the boat was in calm Tahitian lagoons, but to do this properly we must haul out. So that is the first priority, repairing & strengthening the wings. The second priority is general maintenance: bottom paint (which lasts ~2 years anyway), packing glands, and thru-hull valves. Hiva Oa Boatyard, 2017. They use a “Hydraulic Trailer” which slides under the boat and hoists it up with hydraulic pads, common in French Polynesia. Ventura Boatyard, 2015. They use a “Travel Lift” which is a huge sling to hoist up the boat, common in US. Good luck with the (solid) wings so that Aldebaran may once again fly. As long as the ‘motor’- the (flexible) wings above- is in good shape, why not?